We have thousands of properties for sale all over France. But we've no property for sale in Trébeurden at the moment. And that's something we want to change. If you have a property to sell in Trébeurden (or nearby) then act now to get a 50% discount. Just place your advert in the normal way (Click here to place your advert). Then send us an email quoting "Trébeurden" and telling us that you you saw this offer. The village of Trébeurden, which lies in Brittany, on the northern coast of France, is a pretty old fishing village which is adapting well to its new incarnation as a tourist destination for those who love nothing better than a slice of authentic Breton life. The village is well situated for further exploration of the area too, close as it is to the pretty town of Perros Guirec, the pink granite cliffs that sweep dramatically along this stretch of coast, the stunning beaches of Ploumanach, the port of St Malo and the lovely mediaeval town of Dinan. A truly delightful way to spend a morning is on offer to all who are in Trébeurden every Tuesday morning... as long as they can be bothered to get out of bed early enough! The market sets up in the centre of the town, and all manner of gleaming fresh produce is laid out on the stalls, tempting you to buy everything from glossy fruits and vegetables to seafood, crepes and aromatic paella. Trébeurden has made the transition from traditional fishing village to seaside resort without losing its charming atmosphere, but it's good to know that all the facilities you need to enjoy a modern lifestyle are on hand. There are shops, restaurants, bars and banks as well as ancient churches, monuments and stunning landscapes. If you feel the need to take up a sporting activity, perhaps to burn off all the wonderful food and drink you will doubtlessly have consumed in Trébeurden, you will discover there is plenty of choice. The village has sailing and scuba diving schools, fabulous beaches for sunbathing, swimming and beach games, lots of cycle tracks and walking trails and nearby there is tennis, horse-riding and mini golf. You can fly into Dinard's airport with Ryanair or Air Aurigny, or you may prefer to fly to Brest with flybe or Ryanair. Of course, you could choose to take the ferry to St Malo, which is near enough to the town to make travelling easy. Train travel is a little more complicated as you have to make a few changes along the way, but the station at nearby Lannion makes it possible to travel by rail should you so wish. Property in a popular holiday town such as Trébeurden does tend to be more expensive than that which lies inland, in less sought after spots. Trébeurden property, however, does make a good investment, and is also quite desirable for holiday letting too, allowing you to recoup some of the initial costs should you wish to take this route. Do you know Trébeurden better than we do? Do you have photos of Trébeurden? Trébeurden is located in north-western France. It lies in the very north-west of the Côtes-d'Armor department. 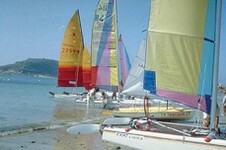 Access: By air: Fly to Brest or Dinard. 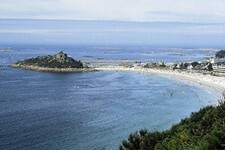 By boat: The ferry ports of Roscoff and St Malo are the closest to the town. Economy: The economy is led by tourism, although it was once essentially a fishing village. Interesting fact: The inhabitants of Trébeurden are known as Trébeurdenais.